Putting nutritious food into the mouths of children has always been a top agenda for Volunteer for the Visayans (VFV), over the years program developments have led to additional services such as providing daily free breakfast for children enrolled on our Child Sponsorship Program and regular grocery subsidies for kids on our Dumpsite Project. The issue of food security and hunger has never been more crucial than what it is today. As the economic climate continues to waiver in uncertainty, many low income Filipino communities are finding it more and more difficult to feed themselves. On top of this, poor education on the topic of nutrition has created numerous Public Health Concerns such as diabetes, chronic heart disease, vitamin A deficiency, undernourishment and PEM. These issues not only stem from poverty, but also from poor nutritional awareness. Even simple values such as the dangers associated with heightened sugar, salt and fat content are not appreciated by all Filipino communities. One of the highest risk groups are preschool children, aged between 3 – 6 years old, who often miss their growth spurts as a direct result of undernourishment. To this end, Volunteer for the Visayans has spent the last two years dedicated to developing 6 month supplementary feeding projects for preschool children which are paired with projects designed to raise nutritional awareness in their mothers. Prior to the beginning of any feeding project, Volunteer for the Visayans staff and international volunteers on VFV’s Nutrition Project will liaise with municipal officials to locate the barangays with the highest volume of undernourished children. From there, VFV staff and volunteers will survey children and their families; recording such data as the children’s height, weight and mid-upper arm circumference. At the same time, the educational and economical background of the family will also be reviewed through VFV’s nutrition screening survey. After all data is collected, VFV will compile a list of the thirty (30) most high risked children in the barangay and provide a daily six month supplementary feeding program designed to provide highly nutritious food once a day. 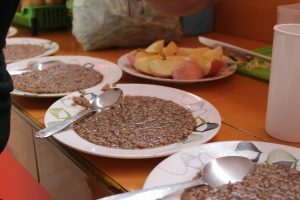 The project is supervised with international volunteers who have experience in the field of nutrition and dietetics, since there are very little local experts available. At the same time as providing the feeding, volunteers and staff work closely with local mothers to help promote the importance of eating healthily and offering advice to parents as to how to make the most from their daily food budgets. 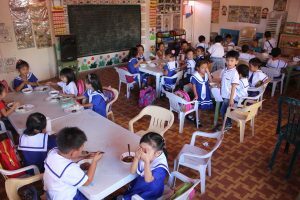 One thing that Volunteer for the Visayans has learnt is that it is much more cost-effective to feed children in a group setting than on an individual basis. For just six hundred peso (P600.00) a day, VFV can provide a highly nutritious meal for up to thirty-five children. From this, VFV has envisioned on continuing its feeding project after its initial six months by attempting to get local communities to work together and contribute towards a community kitchen project. In essence, the project would see local mothers each contributing 10 pesos per feeding so that their child can be provided with a nutritious meal. To begin with, the project would continue to be supervised by Volunteer for the Visayans, until the community showed that they could continue the project independently. In addition, communities would be assisted in creating community gardens to provide fresh produce that would lower feeding overheads. Should all of these elements come together, communities will be able to sustain-ably continue with community feeding and decrease the frequency of highly undernourished children. You can help a community feeding in a number of different ways. 1. Do you have a good solid base of knowledge in the field of nutrition? If so, why not consider becoming a volunteer nutritionist and assist community feedings. 2. Make a donation. We can feed 35 kids for one day with highly nutritious food for just $13 USD. For a little bit more we can provide communities with tools and seeds to grow their own fresh produce and move towards self-sustainability. 3. Donate multi-vitamins to a feeding program.